Quito’s Old Town has been a UNESCO world heritage site since 1978 and is undoubtedly one of the city’s most precious highlights. The beautiful streets and plazas have been lovingly restored and are alive with the constant buzz of daily life; it’s a wonderful place to amble through and soak up the atmosphere. What’s more, there are a huge number of chapels, monasteries and museums to explore, so we’d recommend dedicating a full day to the exploration of this cultural gem. Quito’s Middle of the World Monument is a bit of a tourist trap, but understandably so, for the monument was built to honour the place where the equatorial line was first calculated and has since become a popular spot for those seeking stunning views of the surrounding countryside and a unique photo opportunity. It’s a lively spot that welcomes folk singers and local dance performances on weekends, whilst an on-site cultural museum will provide you with all the insight on the surrounding area that you could need. The Quito Teleférico is one of the highest cable cars in the world and riding it is absolutely the best way to catch the most spectacular views of the city. When you’re on board, you’ll jump from around 3000 meters to over 4000 in around ten minutes, so acclimatising to the altitude might take a little while. Reaching the top is well worth any protest your body might be making, however, as the sights from such a height are incredible. If you’ve not been affected by the altitude climb, then why not continue your adventure by embarking on a hike up the side of the nearby Pichincha Volcano? The views only get better from up there, but remember to dress warmly and bring lots of water. 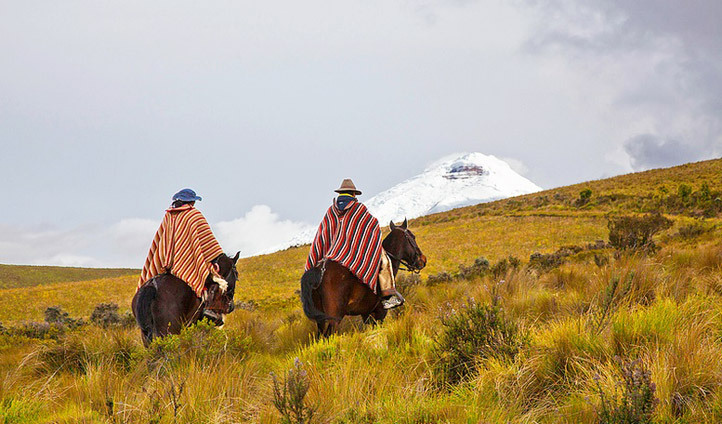 There are lots of authentic ranches just beyond Quito that offer exciting horse riding tours through some of the area’s most stunning landscapes. You’ll learn all about volcanic history and the local Andean agricultural traditions and so get a better insight into the wilderness that surrounds Quito’s bustling streets. All of the horses are well trained and will look after you as you explore this beautiful region; all you’ve got to do is find your rhythm and let the landscapes and their stories unfold before you. Along with phenomenal scenery, Ecuador also boasts 1600 species of birds, making it top of the list for any nature lover. Nestled to the northwest of Quito, Tandayapa Valley is a haven tucked away from the thriving city. Tandayapa Bird Lodge is located 30 minutes away from the hustle and bustle and is perfectly positioned for capturing these birds on your camera. With an outdoor Jacuzzi and hummer feeders on the deck, this lodge combines relaxation and bird spotting.